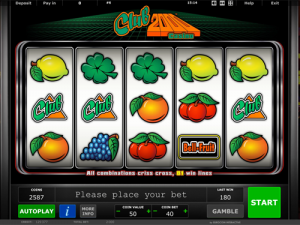 Club 2000 Casino is an old school slot game with tons of retro charm. Although it’s a pretty new slot game from Novomatic, you’ll feel like it’s decades old. The sounds, the graphics and the symbols will take you straight back to the 80s! The logo is so retrotastic, it could belong to any arcade game. All you need is this Novomatic slot, a synthwave soundtrack, a pair of roller-skates and you’ll have the recipe for a great 80s day. This charming retro slot game has five reels and a total of 81 paylines! It has an extremely high RTP (theoretical payout percentage) of 97%! That makes it one of Novomatic’s highest-paying slot games and one of the highest-paying slot games from any developer. Novomatic slots are usually around 95-96% so this game definitely has an edge. Club 2000 Casino also has mystery wins and any combination wins! That means you don’t just have to line up symbols from the left to get paid. Beyond the reels, you’ll see that this slot is set in a good, old-fashioned, brick-and-mortar casino. Plenty of other Novomatic slot machines are also in the casino – including Grand Slam Casino and Simply Wild. Novomatic don’t only make great slot games, they also make top-notch table games, like Poker, Sic Bo and Blackjack. Which Symbols Are in the Club? All the traditional slot symbols have made it into Club 2000! You’ll see symbols on these reels that have been adorning slot reels for almost two centuries. This game comes to you from Novomatic and Bell-Fruit games, one of the best and oldest slot machine makers in the UK! It will make sense then that there is a Bell-Fruit symbol on these reels, which is the best symbol because it pays out the most amount of money! In descending order of value, in terms of the size of payouts that the symbols give, there’s also: golden bells, red stars, watermelons, strawberries, four-leaf clovers, grapes, plums, oranges, lemons and cherries. Each symbol has only one payout and that’s for three matches. Unlike many other slot games, from Novomatic and from other developers, these payouts are easier to get. The matching symbols don’t have to follow paylines only from the left. The matching symbols will pay out when three of them land on neighbouring reels. Whatever position they’re in, as long as all three land on reels that are next to each other, you’ll get the payout. For example, one cherry anywhere on reel 2, another anywhere on reel 3 and a third anywhere on reel 4 will give the payout. This rule applies to all of these symbols! The only symbol that has a different rule is the Club 2000 symbol. This only needs two matches to pay out. Again, these two symbols can land anywhere, as long as they’re on reels that are next to one another. The wins from these symbols are a mystery! You never know how much they are going to pay out. They can pay out as little as the fruits or as much as the Bell-Fruit symbol. The payout will be revealed to you after you’ve spun the reels and two or three have landed in winning positions! Club 2000 Casino certainly isn’t the only slot in the Novomatic club! Novomatic are known internationally for making some of the best casino games ever. For online casinos, they make slots, video slots, live casino games and table games. That’s on top of the slot machines they make for real casinos! Many of their online slot games are loved by players all over the globe. Hundreds of online casinos host their games. The most-played and most-loved Novomatic slot games are: Book of Ra, Lucky Lady’s Charm Deluxe, Power Stars, Ultra Hot Deluxe and Lord of the Ocean. The original game from this series is called Club 2000 – it’s very similar and a perfect slot for novice players.